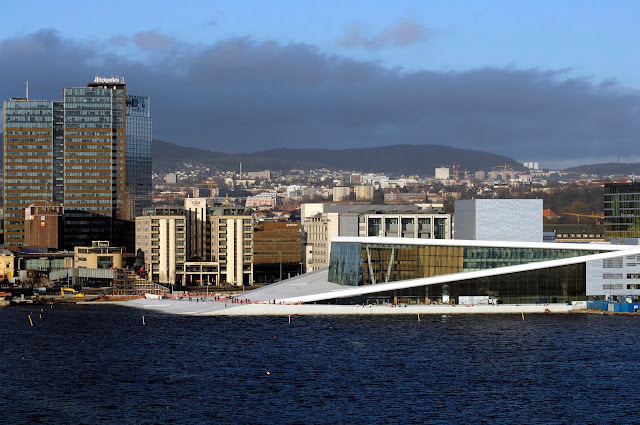 2015—the Year of the Vikings—Viking Cruises that is! A new era in ocean cruising is about to begin with the most anticipated ship of the year—Viking Ocean Cruises' Viking Star. Photo: ©Viking Cruises. While Viking Cruises won't be shattering world records as they've done for the last two consecutive years, they will redefine ocean cruising as we know it today. In April, 2015, Viking Cruises will embark on new horizons, oceans filled with of opportunities to discover new destinations, new cultures and new memories in the making—a new dawn for the Viking age—Viking Ocean Cruises and the much anticipated arrival of her first ship, Viking Star, soon to be followed by two more ocean-going vessels next year—all to sail the European seas. Viking shattered its own world record when it launched 14 Viking Longships in March 2014. Photo: ©Viking Cruises. And if that isn't enough to have you reeling with excitement, Viking River Cruises will launch 12 new ships as well: 10 of its award-winning Viking Longships and two uniquely designed vessels to navigate the Elbe River in Europe; bringing the total to a staggering 64 river-cruising vessels! It's no secret I am in love with Viking and the superior product they provide, but I believe they'll outdo themselves once again in 2015 despite not setting a world record, with the debut of Viking Oceans and the continued expansion of the river-cruise products. Truly, 2015 will be a year to remember—a year for the Vikings—conquering the rivers and the seas! 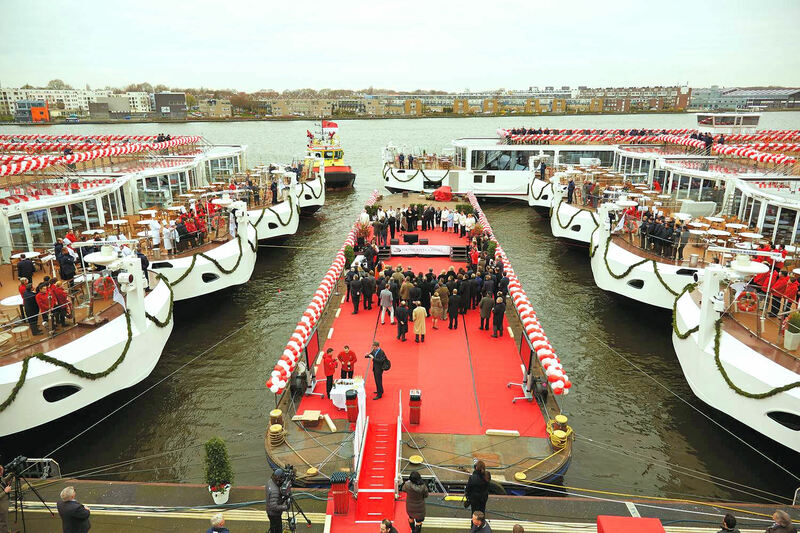 In 2012, Viking Cruises launched a new generation of river-going vessels—the Viking Longships. Here is the Viking Odin in Volendam Netherlands. Photo: EuroTravelogue™. Let's start on the rivers of Europe. Introducing the Viking Longships. With their debut in 2012, Viking launched the next generation of river-going vessels—enhanced engineering, elegantly appointed interiors and "green" technology. Among the innovations: energy-efficient hybrid engines for smooth sailing along the rivers of Europe; solar panels to harness the sun; the indoor/outdoor Aquavit (Waters of Life) Terrace that brings the outdoors in and provides sweeping panoramic views of the landscapes ahead. There's even an herb garden for harvesting only the freshest ingredients. Viking Longship Atrium Lobby. Photo: EuroTravelogue™. Tastefully decorated, the Scandinavian interiors are nothing short of elegant from the public gathering spaces to the well-appointed staterooms with a view! Accommodating 190 guests in 95 staterooms, these vessels are quite intimate and before long, you're friends with everyone. To sum it all up, elegance and efficiency combined with Viking traditions and intimate settings are at the heart of these magnificent longships! On March 24, 2015, 10 more of these intrepid vessels will join Viking's fleet with the promise of new itineraries as well. In addition to the Viking Longships, two new ships specifically designed for the Elbe River will debut and double Viking's presence on the Elbe. Providing even more intimate settings than the longships, the elegant Elbe vessels—Viking Astrid and Viking Beyla will accommodate 98 guests in 49 staterooms and will feature Viking's signature Aquavit Terrace, hybrid engines, solar power—among those mentioned above. These new ships will ply the waters of the Elbe on 10-day voyage, the "Elegant Elbe" from Berlin to Prague combining hotel stays and a cruise through Eastern Germany with visits to six UNESCO World Heritage sites. Viking Oceans will redefine ocean cruising when it begins its maiden voyages of the Viking Star in April. 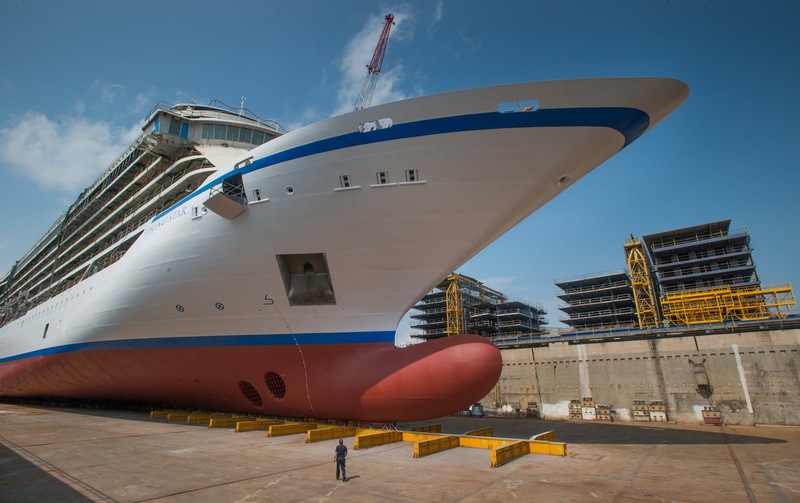 With it launches a new class of ocean liners infused with the Scandinavian elegance for which Viking is well known for. And it doesn't stop there. Next year, sister ships Viking Sky and the Viking Sea will enter service with all three conquering Scandinavia, the Baltic and the Mediterranean. Viking Star Float-out Ceremony on June 23, 2014. Photo: Viking Cruises. Inspired by past guests and world explorers alike, the new itineraries will offer enriching immersions in the arts, histories and cultures of the destinations visited. And because of Viking Star's intimate size, the ship will be able to cruise into ports not usually visited by the mega ships which means Viking will bring their guests even closer to the destinations! Plus, with extended time in ports, guests will now be able to enjoy late-evening concerts and local nightlife. Deluxe Veranda Stateroom. Photo: ©Viking Cruises. Five categories of all-veranda staterooms starting at 270-sq. ft. with Wi-Fi, king-size beds, large bathrooms and LCD TVs—your home away from home on the seas. 14 Explorer's Suites will debut ranging from 757 to 1,163 sq. ft., each offering sweeping panoramic views from their wrap-around decks. 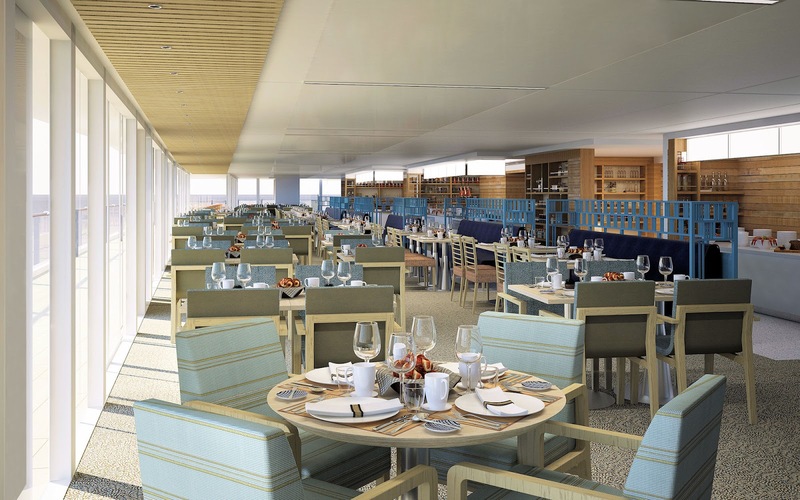 Two-story Explorer Lounge at the bow of the ship will provide the perfect setting for lectures as well as mingling with other Viking guests. 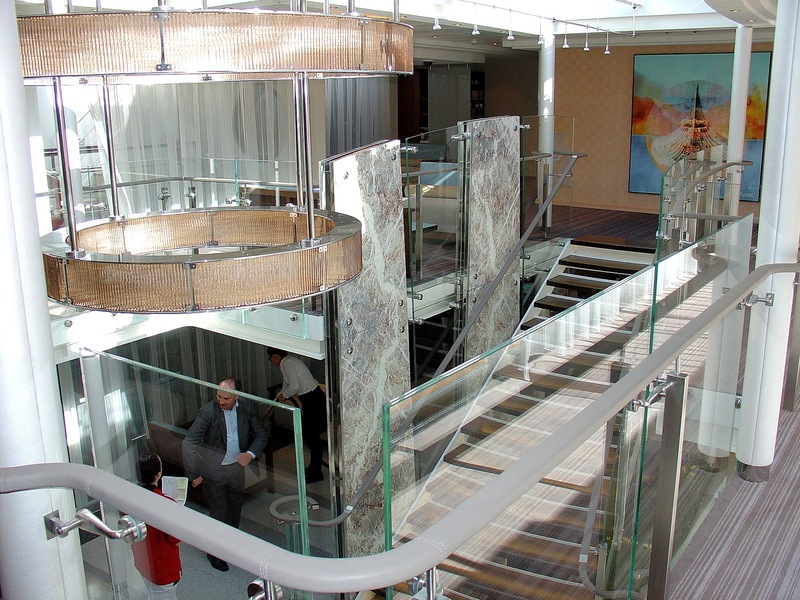 The two-story Explorer Lounge offers incredible views of the voyage ahead. Photo: ©Viking Cruises. 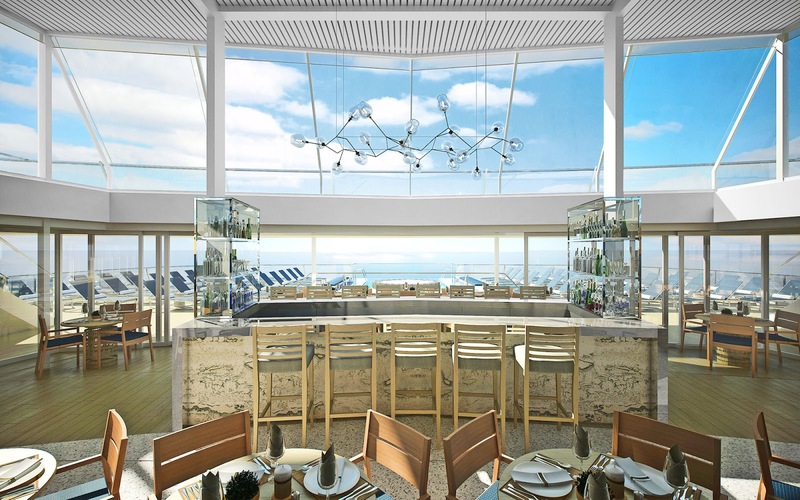 The signature Aquavit Terrace, one of my favorite places on the Viking longships, makes its appearance on the ocean-going vessels but in true Viking fashion, a much grander in scale. It will be located aft adjacent to the infinity pool. 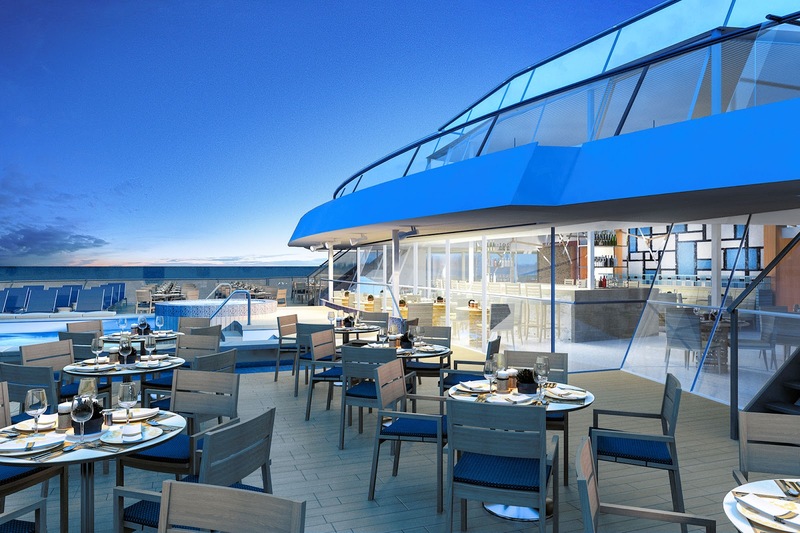 Overlooking the industry's FIRST infinity pool will be Viking's Signature Aquavit Terrace. Photo: ©Viking Cruises. For afternoon tea, head to the Winter Garden for a relaxing afternoon tea and biscuits. The Wintergarden Lanai is a perfect place to enjoy an afternoon tea. Photo: ©Viking Cruises. Main pool with retractable roof plus the industry's first infinity pool located aft. Sure to take your breath away. 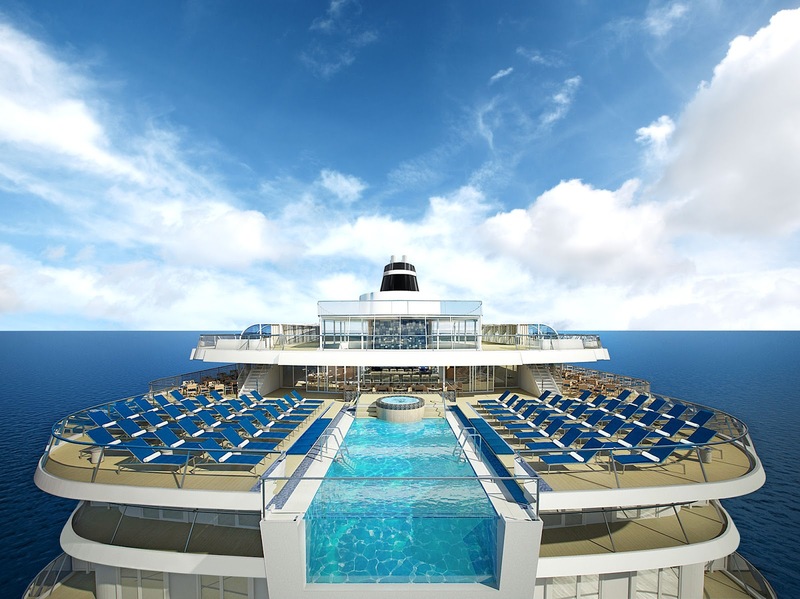 Viking Oceans Cruises will introduce the industry's first infinity pool adjacent to the Aquavit Terrace. Photo: ©Viking Cruises. The Spa onboard embraces Scandinavia's holistic wellness philosophy from sauna to snow grotto with gently falling snow flakes! The World Café. Photo: ©Viking Cruises. The Restaurant and the World Café serve up global cuisines and regional specialties. Italian Grill with a tastes of Tuscany. Chef's Table complete with pairings of course. The Kitchen Table serving fresh, locally-sourced ingredients. Of course, 24-hour in-room dining will always be available. Not one but TWO cinemas will show first-run films and destination classics like "Roman Holiday" and "Room with a View." 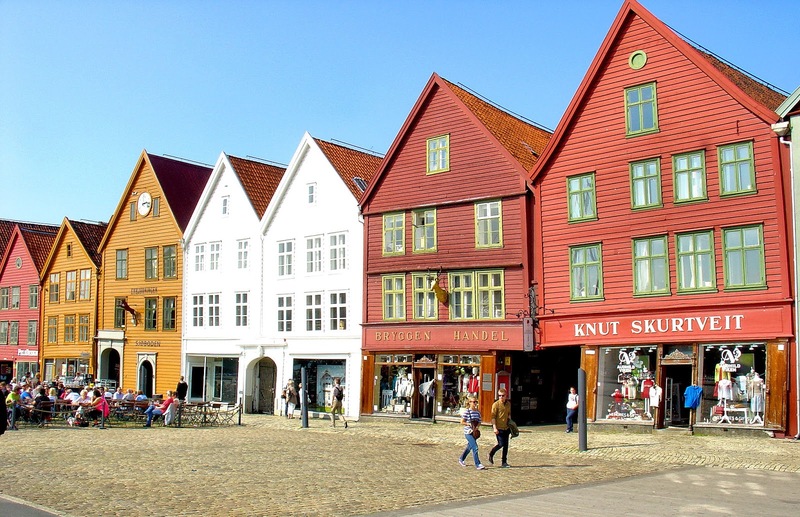 Viking Homelands—15-day cruise through Viking country from Stockholm to St. Petersburg and Copenhagen to Bergen; plus stops in Helsinki, Tallinn, Gdansk, Berlin (Warnemünde), Aalborg, Stavanger and Flåm. Passage Through Western Europe—15 days of cruising through Bergen, Norway; London's Thames (thanks to Viking Star's intimate size); Paris (Rouen); Lisbon; and Spain's Cadiz, Gibraltar, Cartagena and Barcelona. Mediterranean Odyssey—13-day cruise to Toulon, France; Monte Carlo; Tuscany (Livorno), Rome and Naples, Corfu (Kerkira) Greece; Dubrovnik and Split in Croatia; plus overnights in Barcelona and Venice. Empires of the Mediterranean—10 days beginning in Venice and cruising to Pula and Dubrovnik in Croatia; Kotor, Montenegro; Santorini, Athens (Piraeus), and Ephesus (Kusadasi) in Greece and an overnight stay in Istanbul. 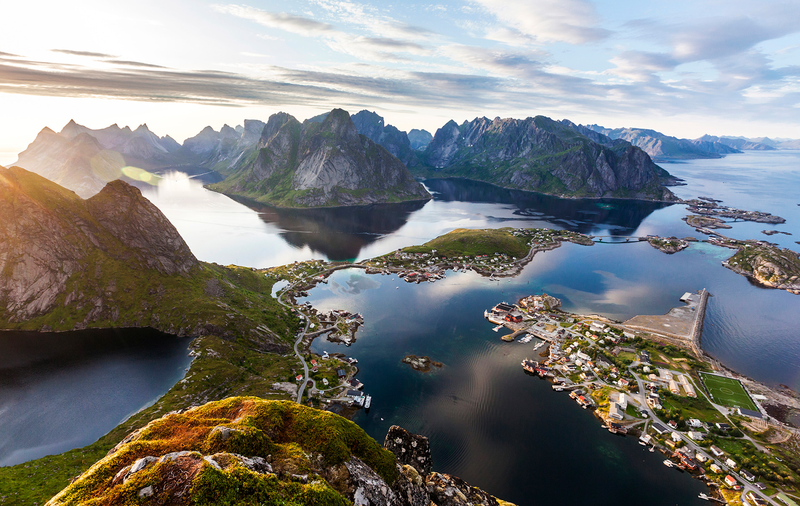 Uniquely Viking, Combination Cruises combine any of the aforementioned cruises from 22 to 50 glorious days and nights and an unforgettable cruise through Europe! The Viking Star will be Christened in Bergen, Norway, on May 17, Norwegian Constitution Day. Photo: EuroTravelogue™. Stay tuned right here as we usher in a new era of ocean cruising with Viking. The Viking Star will be Christened in Norway with godmother Trude Drevland, the major of Bergen, performing the time-honored traditions in a ceremony on May 17, 2015—Norwegian Constitution Day. Have you sailed with Viking? 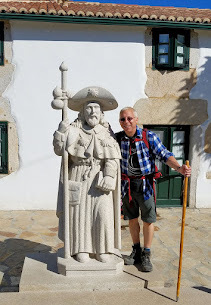 Are you a past guest of Viking River Cruises? 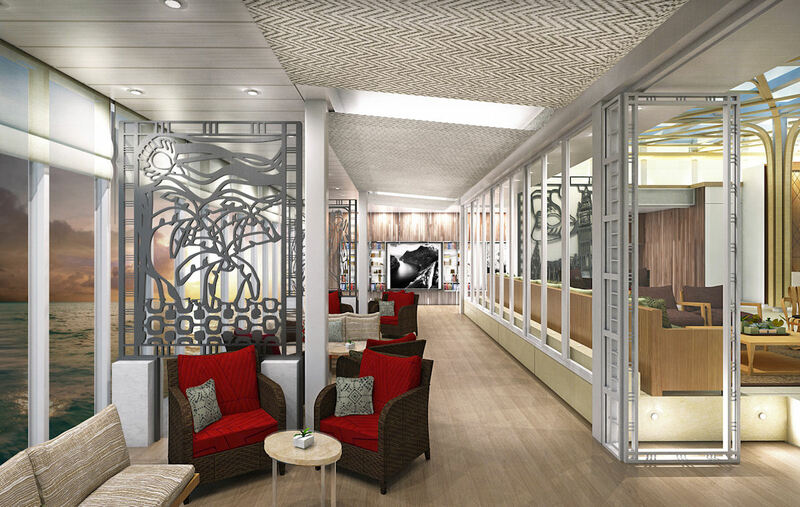 Are you excited about Viking's expansion into Ocean Cruising? What are you most looking forward to with onboard Viking Oceans? Please tell me all about your experiences below. How exciting Jeff! The new ocean class ships look absolutely amazing! I love the tea room and the Nordic pictograph pillows on the bed are a splendid touch. I'm happy to hear that they are incorporating more art and culture excursions and lectures into the voyage. I've never been on a cruise and the lack of cultural content has been one of the main reasons why. This is a great addition and not surprising from an industry leader! Can't wait to hear more! I'm really surprised that the new river ships will only have 98 passengers. Are the other river cruisers that small? Sounds very intimate and like it would be an awesome experience. Hi Christina!! I love the fact that you mentioned the Nordic pictographs!! Only your discerning eye would hone in such details!! I love it! And glad you like it too!! Let me tell you that Viking is all about immersing guests into the arts and cultures of their destinations and with Viking Oceans, the experiences will be even more grand! As far as other lines with fewer passengers, yes some of them are quite intimate but these Elbe cruises would be the piece de resistance, I am sure of it! Thank you so much for stopping by and sharing your thoughts!! And I certainly hope you embark with Viking one day soon and experience their enriching excursions for yourself. Yes my friend, you now have oceans of opportunities before you. ; ) I sure hope you get to experience their product one day soon, you won't regret it!! Thanks so much for stopping by and sharing your thoughts! Oh Jeff, this is fabulous! I loved the Viking River Cruises and hope to make it on another one in 2015, maybe this time on a different river! Hi Cindy! I sure hope you get to experience Viking on the rivers or the seas in 2015. Thank you so much for stopping by!! Oh you lucky chap! You've enjoyed the best of Viking Cruises and it really looks so inviting!!! Tell us more on your next one! Hi there Marlys! Thank you for your kind words! I have been truly blessed with the cruises I have done in the past and hoping to experience to Viking Oceans too! I am just going to call you Mr. Viking. You have actually put cruising on the long ships on European rivers in the back of my mind for a future trip. They sound like a very progressive organization - and a very nicely written blog Jeff. Hi Leigh and thx so much for stopping by! I am truly honored to be called "Mr. Viking" but as Viking once told me, "if the shoe fits!" LOL! Thank you for your kind words as well! Didn't know this was a Norwegian company (I'm assuming since the chairman is called Torstein Hagen). You have the best trips, Jeff. Hi there Sophie. LOL! No trips yet, this is just to communicate what's happening this year for Viking Cruises! Isn't it all so wonderful? And wow, didn't know you were a Viking too, Viking heritage runs deep in Viking Cruises as you know. Thanks so much for stopping by and sharing your thoughts!! Crusing the Elbe sounds like a fabulous idea to me. Haven't had the pleasure of a Viking river cruise, yet, but they do seem to have some awesome ships and itineraries. The ships look enticing, inside and out. Hi Cathy and thanks so much for stopping by. Couldn't agree with you more about the Elbe, I have wanted to sail the river for a long time because I've never experienced that region of Europe before. Hope to one year soon! Glad to hear I've got your attention. ;) Stay tuned right here my friend for lots of Viking updates throughout the year! Most of all, thank you for stopping by and sharing your thoughts! 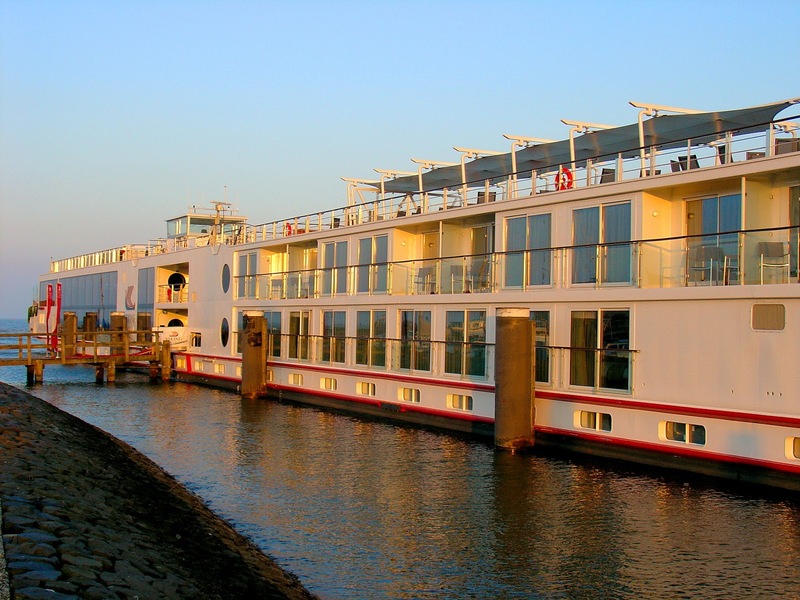 Hi Jeff, We took a Rhine cruise with Viking and became enamored with river cruising. 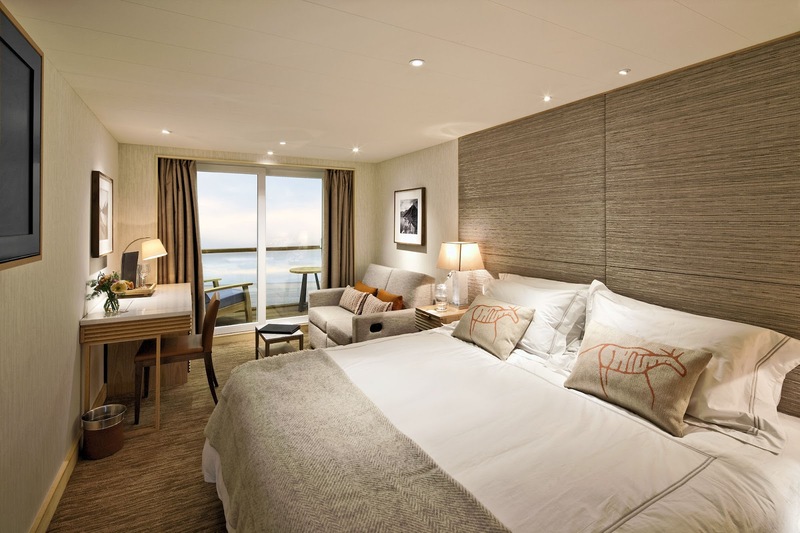 It's exciting to hear about Viking's new oceangoing itineraries. We are definitely interested in experiencing those as well. The only challenge will be choosing which one to do first. Hi there Linda!! I couldn't agree with you more! I fell under Viking's seduction in 2012 and ever since, I've been a HUGE fan. And now with Viking Oceans, cruising in Europe will never be the same! Thank you so much for stopping by and sharing your thoughts! BTW, I will be sailing the Rhine with them in SEPT. CANNOT WAIT! I haven't sailed with Viking yet but I for sure would want to one day. WoW those ships looks fabulous and the Viking Homelands itinerary looks really interesting. I can't wait to experience their ocean-going voyages!! Their river cruises are exceptional and so too will be their sea voyages! Thank you so much for stopping by my friend! Hi Jeff: What an enticing post. Such great photographs! Make me want to book a Viking River Cruise. Have never had the pleasure yet, but definitely on my Bucket List. Thanks so much Doreen for all of your kind words!! Hope you have the opportunity soon to enjoy this superior product by river or ocean!! 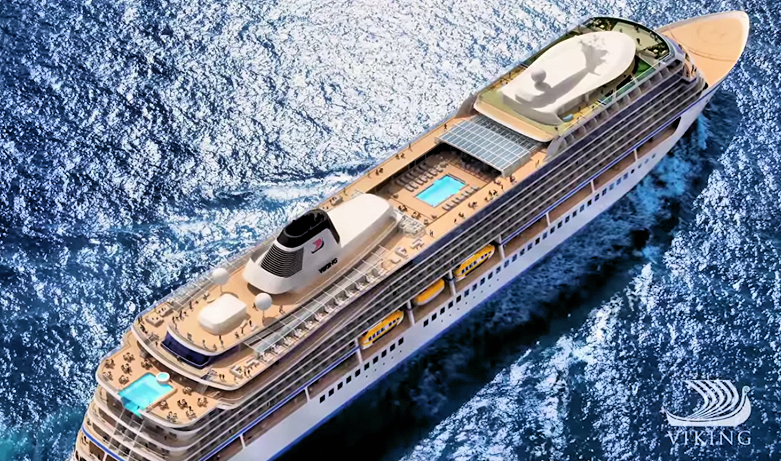 It's so true that cruising on the mega-liners seem to be more about the ships than the destinations. The Viking experience on Europe's waterways looks extraordinary. I'd sure be up for that infinity pool beside the aquavit bar! I couldn't agree with you more Lesley! Stay tuned! I will be on preview cruise come May 2 from Barcelona to Lisbon. Will be sharing all the details right here. I have always thought of a cruise as a floating hotel and means of transportation to see many ports and areas of the world. Wanted to book a Viking Ocean cruise but all the salings for our time frame and price point were already sold out for 2015 and 2016. So waiting for the 2017 lists to come out. It is the first time I have been smitten by a ship itself. There is something about the openess, views of water, sleek interior, that have captivated me. Now ,I wait to see if the ship lives up to the artist's rendition. Look forward to your report. I found your site today. It is beautiful. I have bookmarked it. Hi there Lakeview! Thanks so much for stopping by and for your kind compliments as well. I really appreciate your sentiment! I too am looking forward to experiencing the new ship and see it all come to life. I have no doubt that Viking will exceed my expectations and even be more wonderful than the renderings promise it to be. Let's hope you can finally experience in 2017. Thank you again! My pleasure Shaon! Thank you for stopping by!